“It is fun to be in the same decade with you.” They had just spent three weeks together at the White House, in strategic war planning and personal friendship building. 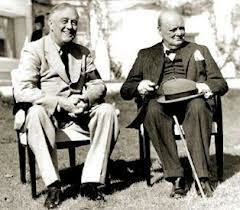 Upon his return to England, Churchill found the note that Roosevelt had wired ahead. Two men, leaders of nations, allied together against the Axis powers – they were commanders in chief, in the midst of warfare, who also found delight in a deep friendship. When I read this note penned by FDR, I couldn’t help but reflect upon the last three decades of my life, the highlight being the pleasure of partnering with one beautiful woman. Together, we have walked through history, aware of the evil axis of this age, the plotting of the “god of this world”, expressed through evil nations but also in the daily, domestic life of married couples and families. Since the garden, God has sought to express a prophetic witness on the earth of bridal, covenant love. Humankind has been vested with authority and stewardship to represent God’s kingdom on planet Earth. The greatest strength in a Christian marriage is when husbands and wives wear their robes as kings and priests. Attacks come unannounced, devised to catch us, unprepared. Every married couple since the garden has experienced this onslaught. I like the fact that the President used the word “fun.” Deep friendship, joy in the journey, fighting side by side – a comrade in arms is my spouse to me. This creates a perimeter of protection around our relationship. Every marriage that is fighting for excellence needs to find the mirth in the midst of madness; the kindness to combat the cruelty of the war that’s raging. They stood in front of war maps; they played card games. They solemnly reviewed the casualties of the war at sea, Germany holding dominion over the shipping lanes; they enjoyed good food and conversations. They battled with Congress over appropriation measures; Churchill found time for his daily afternoon nap (a man after my own heart). There will be times in your marriage to tighten up; there will be times to lighten up. Find the fight and you’ll find the fun. Thanks, hon. I like it! !